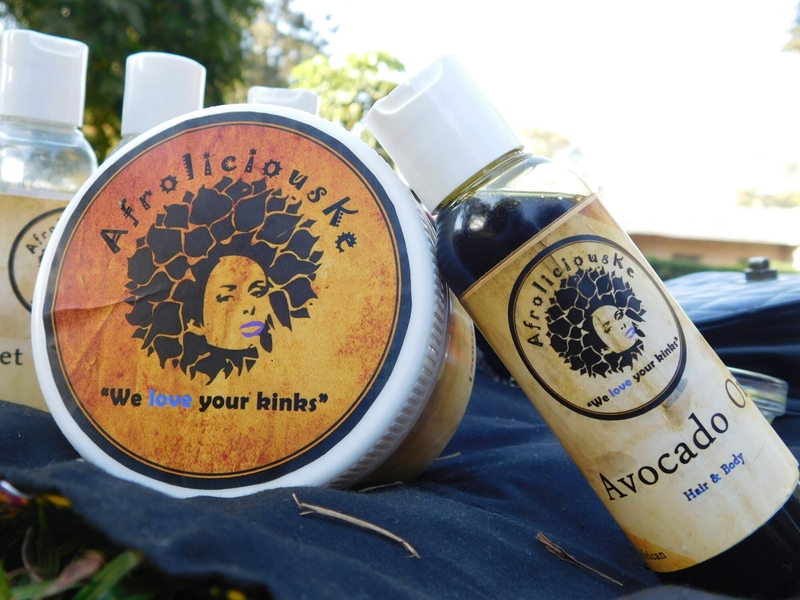 afroliciouske | Natural Hair and Skin Care. Natural Hair and Skin Care. With a lot of people looking for ways to help their hair retain moisture while reducing product build up, Cowashing has become a fan favorite. Let’s discuss the WHAT, HOW, and WHEN of using a co-wash.
A co-wash is a cleansing conditioner that gently cleanses your hair and scalp without stripping them of their natural oils. It provides you with the best of a shampoo which cleanses and a conditioner which coats and moisturizes the hair strand. Co-washing can be done weekly to help reduce in your hair. However, it is important to note that you will need to use a clarifying shampoo once a month to fully cleanse your scalp. If you notice white flakes or buildup under your nails when you scratch your head, it is time to shampoo. Use a product that is specifically labeled as a co-wash. Conditioners are made to coat and protect the hair strand, which means that they will not be very effective in cleaning your hair. However, if you do not have a co-wash handy, you can use a conditioner as a short-term substitute. The one conditioner to avoid in co-washing is a deep treatment conditioner/masque. Breakage, dry brittle hair, and a loss of your natural curl pattern are just a few of the things you have to worry about once you decide to bleach and color your hair. Most people choose New Years to reflect on the year and make goals for the new one, but I prefer to do so on my birthday. For my birthday in June, I chose to be bold and dye my hair blue to mark the beginning of a new year in life. So I paid in advance so I wouldn’t chicken out and then headed to Urban Hair Studio and trusted Saul Juma aka #hairdresser254 to work his magic. My hair is naturally black so we had to bleach it twice to get it to platinum blonde and then added the blue hair on top. The entire process takes all day since the hairdresser has to be careful not to damage your hair. Saul added Afroliciouske oils to the bleach to reduce its harshness as an added precaution. Seven hours later my blue was done and ready to face my birthday as a brand new person. The first thing you will notice is how dry and straw-like your hair will feel. It won’t retain moisture and also your color might bleed everywhere. This is because bleaching raises the hair cuticle and you need to do a protein treatment to close the cuticle back down. Do oil treatments and deep conditioning treatments weekly. Do a protein treatment monthly. Always wash your hair with lukewarm/ cold water to prevent the color from fading fast. ROCK YOUR COLOUR WITH CONFIDENCE LEVELS ON 100!! It has been 6 months and I am still very much in love with my hair. You can see more on my experience on FACEBOOK . I didn’t experience any breakage or damage thanks to good hair practices. Have you dyed your hair before and what was your experience? If you could go bold, what color would you choose? Have an amazing and don’t forget to be bold and fearless in whatever you choose. To transition or big chop is the first major decision we have to make when deciding to return to natural hair. While in the past there has been a lot of debate on which route is the right one, we have evolved in the natural hair community and we can agree “to each his own”. The most important goal is HEALTHY HAIR. There are many factors to understand about transitioning to make it a smoother experience. So lets get into it shall we? Dealing with two textures was the greatest learning curve I had to deal with when I started my journey in 2014. You have the old relaxed hair at the top and the new natural growth coming in at the bottom. The point where they meet is the line of demarcation aka “the weakest point” of your hair. It is important to keep both parts deeply moisturized to prevent breakage. Water will be your best friend followed up by an oil or a butter like shea butter or any heavy styling cream to help seal the hair cuticle and keep your hair moisturized. ALWAYS spritz your hair with water before combing and be careful about using heat. If you have to blow dry, make sure you use low heat. Deep condition often to keep the hair soft, manageable and hydrated. Protective hairstyles come in handy when the two textures prove to be too much to deal with and you need a break. Braids, weaves, wigs, crotchet…etc will be your best friend. Protective styles prevent you from manipulating your hair too much, thus reducing the risk of breakage. The process is not always pretty, so cute accessories like scarves, bows beads, and flowers will help to distract others from your current hair struggle. PATIENCE IS KEY. TAKE THE TIME TO LOVE YOUR HAIR AND LEARN WHAT WORKS FOR YOU. Avocado oil is obtained from the pulp of the avocado fruit (also one of our faves, would you believe it? ;) and is dark green in colour with a nutty smell. Our unrefined avocado oil is packed with unsaturated fats, fat soluble vitamins A D E and K and potassium making it great for both your hair and skin. ✨Avocado oil is rich in antioxidants including Vitamin E, which help fight free radicals. Free radicals put stress on the skin and accelerate its ageing. ✨It has unsaturated fats including omega 3 which is effective in protecting the skin against harmful UV rays from the sun, reducing the chance of you getting sun burnt. ✨Avocado oil is an excellent skin moisturiser that penetrates the skin deeply reducing dryness and increasing skin softeness without leaving your skin shiny. ✨You can mash the avocado pulp and mix it with some avocado oil to make a facial mask for skin treatment. ✨Saturated and monounsaturated fats in avocado oil easily penetrate the hair cuticle thereby providing support to and strengthening the hair fibre. Only Jojoba has a higher concentration of monounsaturated fatty acids than Avocado oil. ✨The high concentration of monounsaturated fibres helps to retain hair moisture inside the cuticle. ✨Avocado oil helps to revive hair that has been dried, damaged or weakened by styling, relaxing, heat-styling and even environmental pollution. So if you have split end or frizzy hair, avocado oils would be a great addition to your hair care regimen. ✨Avocado is a light oil so it is easily absorbed by the scalp and skin in general. ✨The combination and concentration of monounsaturated fatty acids, antioxidants (e.g. vitamin E) and phtosterols helps to nourish, protect hair, stimulate growth and unclog blocked follicles. You can get our avocado oil by visiting any of our stockists or calling/texting/whatsapping us on 0707644851 or 0725466132. Moringa oil, also known as Ben Oil is obtained from the seeds of the Moringa Tree also known as The Miracle Tree or The Tree of Life. It is characterized by a long shelf life due to it’s high content of anti oxidants that act as preservatives, making it resistant to rancidity. In it’s unrefined form, it is dark green in colour with a nutty smell. ✨Ben oil is an excellent moisturiser for skin due to its high content of omega 9 fatty acids. It’s well absorbed into the skin leaving it moisturized but not oily. ✨Moringa oil pacifies dry skin and can be helpful in dry, irritated skin conditions like eczema and psoriasis. ✨It has skin healthy nutrients like vitamin A, which helps build collagen in the skin, vitamin C to help reduce fine lines and wrinkles, and the healing and anti-inflammatory benefits of vitamin E.
✨It works wonders in removing black heads and spots from your skin and in encouraging the healing of minor wounds and cuts. ✨It possesses anti-bacterial and anti-fungal properties and can protect the skin and scalp from various types of infections. ✨Due to its high concentration of Behenic acid, it’s an excellent oil for making soaps and other cleansing products that remove dirt and oils. Behenic acid acts as a surfactant that helps cosmetic products foam better and as an emulsifier to allow oil and water to mix in solution. ✨It can carry fragrances and is used as a carrier oil for various essential oils. Due to this property it is used for commercially for effleurage to extract flower fragrance as it absorbs and retains scents. 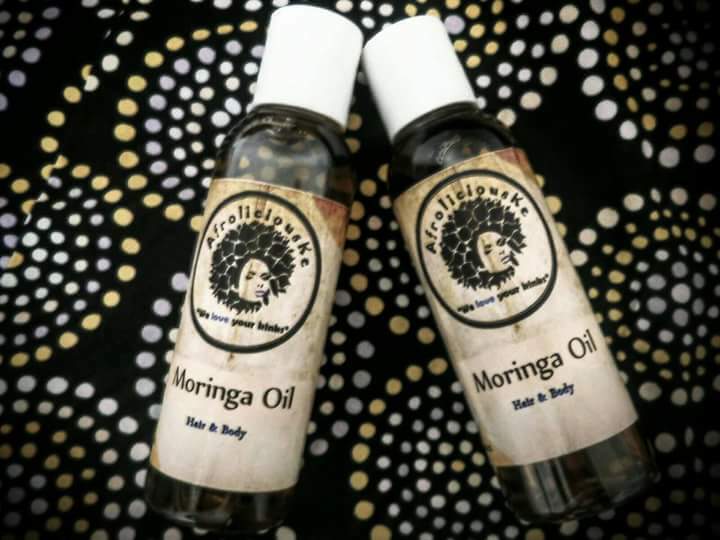 ✨As with other organic natural oils, Moringa oil is an excellent massage oil. ✨Can be used as a hot oil treatment that leaves the hair well moisturized and hair roots nourished. ✨Moringa oil is absorbed quickly into the scalp for fast relief of a dry and itchy scalp. ✨It nourishes weak, damaged hair, strengthening the hair shaft and reducing breakage. ✨Seals in moisture and regular use in your regimen will lead to noticeably softer hair. ✨Behenic acid found in Moringa oil is often used in hair conditioners and moisturizers. It is a conditioning agent that works to smooth out the hair follicle, reducing frizz. ✨To add a healthy shine to hair. Urban Hair Studio on the Ground Floor of Barclays Plaza on Loita Street. You can also reach us on 0725466132 or 0707644851 to make your order abd have it delivered. Today on #FroTipTuesday we want to talk about split ends. What are they? We’ve all had variations of them. Normal, healthy hair strands are covered and protected by a cuticle layer which also regulates the intake and release of moisture from the hair fibers. Sometimes the hair fractures at the ends and starts splitting along the length.The split ends may include two,three and even more fragments and if left untreated can go all the way up to the roots and nobody wants that for their fro. It’ll lead to fragile, brittle hair that breaks easy. So how do you treat it? Visit your stylist or chop them off yourself. There is no way around it sisters..take the scissors and cut right above the damaged part. All other treatments are temporary. -Protective Styling. Do styles that tuck away your ends and reduce incidences of rubbing against your clothes.The roll,tuck and pin has been working great for me. Braids, weaves and wigs come in handy too. We love the Marley braids buns and puff updos too. They are super cute. -Keep your hair and especially your ends,which are the oldest part,very well moisturised throughout. A moisturised fro is a healthy,happy one. -Seal your ends with a heavy oil or butter Examples are Black Castor Oil, Castor Oil, Avocado Oil or Shea, Mango and Cocoa Butters. -Reduce over brushing and combing at the ends and using excessive heat on your kinks. -Make sure you trim your ends on the regular when you notice your hair needs one.